Give your child and his or her friends a birthday experience that is fun and educational. 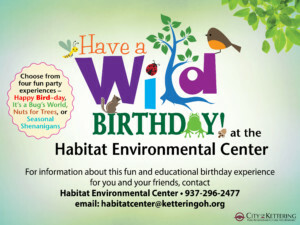 Birthday parties may be scheduled at the Habitat Environmental Center in Kettering. 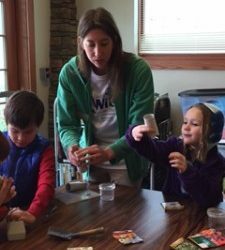 We provide a nature host, themed activities, downloadable invitations and a kid-friendly service project. Enjoy our beautiful building and woodland trails on your child’s special day. Call 296-2477 for more information. Balance (including any add-ons) due the day of the event. Fun science experiments and activities will bring out the inner mad scientist in your child and guests! Experiments will be based on age of birthday child. Explore the magical blue world that captures our hearts, including sea turtles, dolphins, sea shells and more! Discover the slithering, crawling, and gnawing beasts of the forest. We will learn about those animals that do exist and also maybe new ‘beasts’ that only exist in our imaginations. Learn about our feathered friends for your birthday. These amazing flying animals are special in so many ways. We will go bird watching. Some people think insects are creepy. We LOVE insects here at the Habitat. Come and celebrate your birthday with some of our smallest friends and learn how important they are to the earth.